A fully soluble combination of nitrogen, phosphorus, potassium and trace elements for promoting growth in fruit and vegetable crops also containing growth stimulants and a sticker to maximise plant uptake. 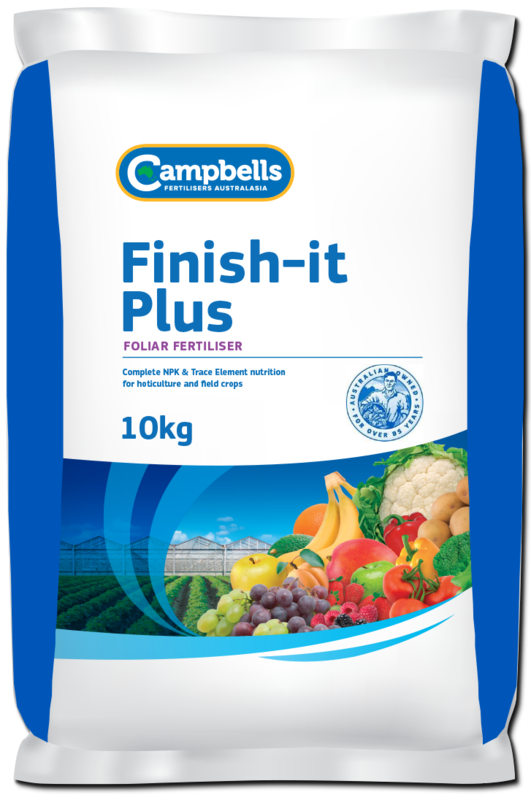 Campbells Finish-it Plus is a flowable powdered product that is fully water soluble and contains a full range of plant nutrients for foliar feeding to ensure good size and quality. Copper, Iron, Manganese and Zinc are chelated to ensure rapid plant availability. It is designed to be absorbed by the plant foliage and will not cause burn or scorch when applied at recommended rates. Campbells Finish-it Plus is suitable for application via foliar spraying. It dissolves rapidly and completely and remains in solution ready for absorption via leaf surfaces. The specific ratio of nutrients in Finish-it is designed to supplement crop nutrition to improve crop size and quality in the later stages the season. Campbells Finish-it Plus is recommended for foliar application. Rates of application vary between 3-5 kg/ha. Specific rates will depend on the crop, stage of crop development and application method. See the Product label for comprehensive information on rates and application methods. Foliar applications should be avoided during extremes of climate and during flowering. Before application seek advice from your Campbells Finish-it distributor or your local agronomist.